There is an exquisite archipelago of thousands of islands between Finland and Sweden. I took a six-hour ferry ride this morning from Turku in southwestern Finland to Mariehamn, capital of the Åland Islands, where I am spending a day and an evening. Most of the islands are formed of a brilliant red Precambrian granite, polished smooth on the top by glaciation. 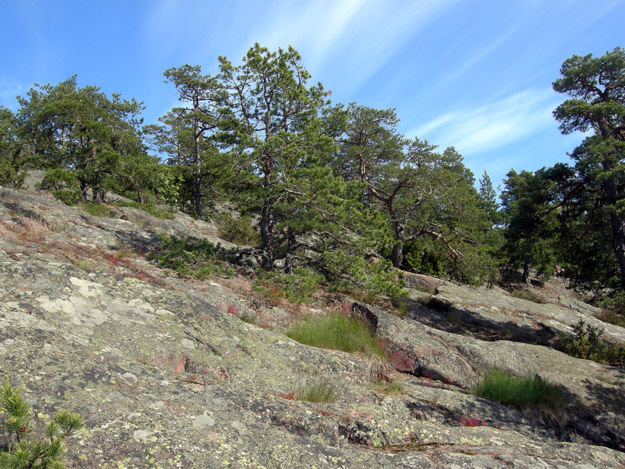 Scraggly pine trees grow in the cracks they can find in the bedrock, reminding me of the terrain in the High Sierra just below tree line. A close look at the granite shows a wonderful mix of potassium feldspars, clear quartz, and flecks of biotite. The weathered surfaces are thickly covered with colorful lichens, which are symbiotic associations of algae and fungi. These islands have an unusual political history. They are populated almost entirely by Swedish-speakers, yet are a province of Finland. Various international agreements in the 19th and 20th Century gave the islanders autonomous status within Finland and, most famously, completely demilitarized the islands, a status they managed to retain through two world wars and the Cold War. They have their own government with a premier and parliament, they fly their own flag, and they print their own stamps. And there you see the attraction Åland has for a geologist. Any place that features geology on its stamps deserves a visit!